Kevin: I like this episode quite a bit, and I'm going to start with the many things I like. First, I like the follow up of the consequences to last season's finale, "Adversary." 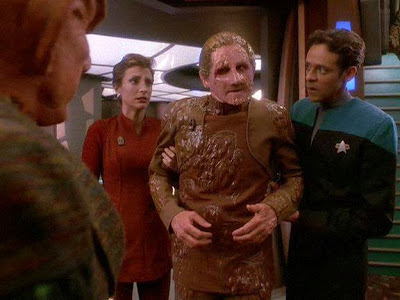 Given the number of times that they intoned the phrase, "No Changeling has ever harmed another," it makes a great deal of sense that there would be consequences for Odo beyond his own guilt. That is a good use of continuity. I like a lot of the character moments we get surround Odo's illness. Kira bringing him the criminal activity report and Garak distracting him with tidbits of his alleged past make sense and are sweet in a non-saccharine way. The scene with Quark on the Promenade was nice too. Speaking of Garak, you could argue that his presence is somewhat tacked on, but I would disagree. I really like the follow up to another great season 3 episode, the two-parter "Improbable Cause/Die is Cast." There was something really chilling about the way the Female Changeling shut him down. Lastly, I liked the idea and several subsequent plot threads we got out of Odo being a solid. The punishment fits the crime to a level even Dante would have tip his hat to, and it gives the character a new conflict. Even as a thirteen year-old, I knew it probably wouldn't last too much into season 5, but that's not really this episode's fault. Matthew: I didn't mind Garak's presence so much as how they failed to follow through on it. The interesting story was really Garak's desire to take out the Founder homeworld if you ask me. I think that dilemma should have played out for much more than the 90 seconds it got in a Jeffries tube. Anyway, I agree on continuity. DS9 has gotten really good at extrapolating the logical consequences of its stories and following up on them in future stories. I can see why Roddenberry and Berman were against it in prior series (too daunting for newcomers) but I like that it's finally just being acknowledged that this show is for nerds by nerds. Kevin: The ramping up of the conflict with the Klingons is a bit of a two edged sword. If there is a criticism of the back half of season 4, it's not the episodes aren't good, most of them are highly enjoyable, it's that they don't really tie into either the Dominion or Klingon plots, save the recent highlight, "To the Death." I gather the writers thought to solve both problems at once with the idea Gowron was the changeling. So on the one hand, I enjoy the idea that they are trying to refocus the show on the ongoing conflicts. On the other, especially tucking the reveal into the last thirty seconds does feel a bit slapdash. The seams are showing in the writing, just a bit. In the balance, I still like it, because without boxing themselves in with a cliffhanger per se, they have set up the next season't conflict that leaves some room for how to go about solving it. That, and the episode was pretty damned entertaining from start to end, and if definitely left me wanting to know what happens next. Matthew: Having Odo "reveal" that Gowron is a changeling certainly did the heavy lifting that was required for future plots, but it couldn't help but feel like lazy writing - so a big secret that lots of characters care about was revealed in a puddle of screen to the fragments of memory of another character? I'm pretty sure this violates the old "show don't tell" saw. Speaking of puddles, the Great Link scenes dragged. Unless you're going to go full "Prophet Vision" on us (please don't...), there is just no way to make puddles communing very interesting to a "solid" viewer. Heck, even the characters on screen were bored by it. Kevin: Lastly, given the number of times Quark, Garak, etc. have flagrantly broken the law on the station, I loved the coda of Garak being put in a holding cell for six months. Sure, that's gonna happen off screen, but hey...consequences! Matthew: If nothing else, this episode definitely felt consequential. So many Trek stories seem to stop existing after the credit roll, only to be forgotten in future seasons - and DS9 has not been immune - Quark has broken the laws of both gods and men so many times as to beggar belief that his presence is tolerated by anyone. So I like that the changes for Odo and Garak (and Gowron for that matter) seem like big ones that will last. Kevin: Certainly no complaints in this department. We've discussed Auberjonois' pain acting issues, but none of them appear here. I like how he played the transformation. I also liked all the character scenes with Kira, Quark, and Garak in particular. The rest of the main cast also did a good job. Bashir got to be a doctor, which I always like. Matthew: Yeah, Auberjonois had good chemistry with Visitor, Robinson, Shimerman and Siddig. It was a pretty strong character story all told. Kevin: Salome Jens returns as the Female Changeling, and she is just fantastic. There's a quality to her voice that feels "other" and still commanding. I loved the scene with her and Garak. It was truly intimidating. Andrew Robinson is also a delight again. There's an urgency to his scene is the Jeffries tube that makes it far more than filler. Matthew: Salome Jens is what makes the Founders interesting. It certainly isn't the writing, which has duffed many major opportunities with the race. She is a truly excellent villain - a cool, simmering menace that always remains under wraps is much more interesting than violent eruptions of anger or hatred. Her scene with Robinson was brief but very effective. Kevin: This is a bit more of a mixed bag. Some of the overlay digital effects didn't look too great. When his whole body was the effect, it looks fine, and when they did the physical makeup, it looks pretty good too. It's when they try to make part of his body liquid that the effect shows its seams. Matthew: The link looked like crap, there's no nice way to say it. The lighting was off, and the rock looked like it was floating in a green screen room. The physical makeup was fine on Odo's face, but not so much on his clothing. Kevin: Beyond that, it's a bottle show, save the Founder's planet. The final result of all that compositing just doesn't quite come off. The pallete is too monotone and the rock is a little too clearly styrofoam. Matthew: On the plus side, all the Jem'Hadar ships looked neat. Kevin: This makes it to a 4. The set up and several continuity payoffs are great. The character work and acting is very good. The special effects are fairly middling, but never distractingly bad. The end result is a damned entertaining 45 minutes and I certainly wanted to know what happens next. They may have pulled together the plots threads at the last second, but I think they did so in an above average way. Matthew: I'm stuck on a 3. For the most part this was entertaining, but I feel like the emphasis was on the wrong aspect of the story and there was a big mushy pacing dead-zone while Odo was in the Great Link. But it's not bad by any means, I think it just fell short of greatness. That makes for a 7 total. I think the moment I truly starting despising the Changelings was when watching The Quickening where they had infected an entire planet and its people with a deadly virus that was accompanied by an agonizing demise just to teach them a lesson. They couldnt just kill them, no. It had to be a horrible painful death. I still find that episode difficult to watch as that level of cruelty is truly something outside of what we generally get to see in Star Trek. There is nothing redeeming about the Founders. Nada. They are a genocidal murdering, sinister race that make the Nazis look tame. Their arrogance and sense of superiority, how they just use everyone - even those who serve them to the death - how they view every other life form in the universe as lowly and disposable and all for NO APPARENT REASON, just pissed me off to the point of making no sense. I mean why? Why were they like this? Cause a few solids some time back persecuted them? Yeah sure, let's start an interstellar genocidal war because we were crossed a few thousand years ago by a few solids. 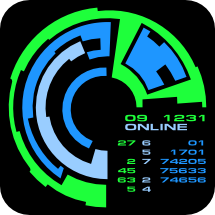 They cost the lives of nearly a billion people and it never ever sat right with me how in subsequent episodes they really didnt get what they deserved, such as the time Starlfeet had the means to infect and kill their entire planet and Sisko and Bashir did everything they could to stop them. Even the ending of the series where they decide to only punish the female changeling while leaving the link intact was truly upsetting, especially given how the Female Changeling had, toward the end, given orders to basically just annihilate all of Cardassia for the heck of it. She KNEW they were losing the war. Yet she still wanted to just kill as many as she could on her way out (which is what makes what she says to Garak here about Cardassia being dead so prophetic and chilling). The Changelings were not just losers in a war, they were war criminals. And they got off easy, with the Link intact and only the Female Changeling in prison. I guess I am getting ahead of myself here but the reason I mention it, is that the Federation's (or Starfleet's) neutered, tame, lukewarm response toward the Changelings is a theme throughout the show and it starts here. They had a few opportunities to put an end to these genocidal monsters but failed. I am reminded of what Seka said to Janeway so deridingly in State of Flux about "Federation rules and Federation nobility" and how that kind of an attitude was why they were stuck in the Delta Quadrant. I guess the downside of being noble is that you end up paying the higher price.